President Obama and former President Bill Clinton this morning teamed up to rally voters in the key state of New Hampshire, a small state where a last-minute campaign push could make all the difference in the presidential race. New Hampshire has just four electoral votes, but as the quintessential swing state, it could make all the difference. New Hampshire is the only state that President George W. Bush won in 2000 but lost in 2004 - in both instances by a slim, one point margin. In 2000, New Hampshire's four electoral votes made all the difference -- if then-Vice President Al Gore had those votes in his column, Florida would've been a moot point. Furthermore, unlike other states where early voting is increasingly significant, CBS News estimates only 10 percent of New Hampshire voters will be casting ballots before Election Day on Tuesday. That makes last-minute rallies like the Obama campaign's event today critical. Mitt Romney visited the state on Saturday, telling a crowd in Newington, "It is time we lead America to a better place." Polls out of New Hampshire showed Mr. Obama with an advantage over Romney in September, but the race has tightened up in the home stretch. The latest WMUR Granite State Poll shows the race tied, 47 percent to 47 percent. Mr. Obama today gave his standard stump speech, using the tragic aftermath of Superstorm Sandy to illustrate his philosophy on government: "We're going to help them rebuild. That's what we do as Americans," he said. "We see neighbors helping neighbors... Leaders of different parties working to fix what's broken... We're all in this together. We rise and fall as one nation and one people." He touted the 5.5 million new private sector jobs created, as well as the strength of the domestic auto industry and the end of the war in Iraq. While telling voters the nation has made "real progress," he said there is more work to do. "As long as there's a single American who wants a job but can't find one, our work is not yet done," he said. Romney's economic agenda would reinstitute "the top down policies that crashed our economy," Mr. Obama said, while his own agenda would create "an economy that's built from the middle out." The president added that "part of this election is not about policy. It's also about who do you trust." Mr. Clinton, who spoke to the crowd just ahead of the president, also driving home the argument that Romney can't be trusted. Alluding to Romney's shifting policy positions, the former president said he wouldn't be surprised if the Republican were offered the job of "chief contortionist at Cirque du Soleil." He praised Mr. Obama for helping to revive the economy, noting, "Compared to what could've happened, Barack Obama has done a good job. The question should be, are we moving in the right direction, not whether we could've been fully healed." 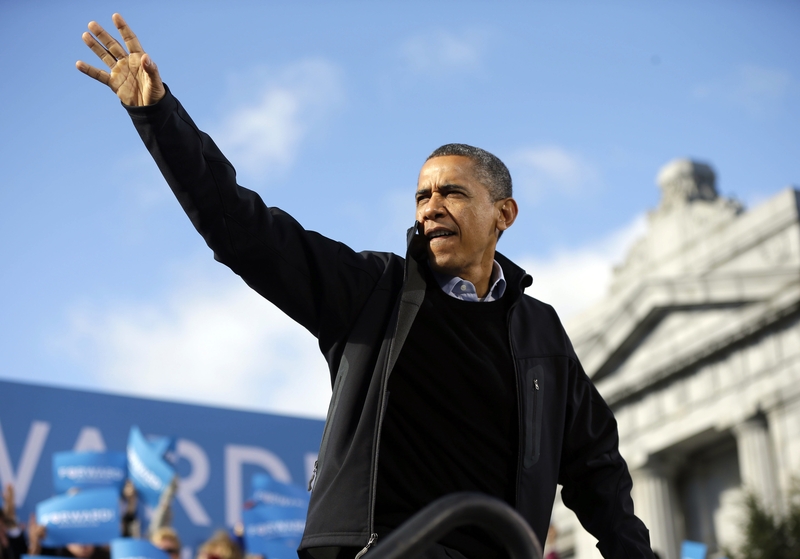 After addressing voters in New Hampshire, Mr. Obama today heads to campaign events in Florida, Ohio and Colorado. Romney, meanwhile is hitting up Iowa, Ohio, Pennsylvania and Virginia today.